The Mary Clap Wooster Chapter participates in a wide variety of educational, patriotic, and community-building activities in Connecticut. Some of the vibrant events that we participate in are described below. Veterans Awareness Day Held at Quinnipiac University in Hamden, this event aims to build increased awareness of the Memorial Day weekend to enhance students' understanding of the freedoms we often take for granted. Located in New Hampshire, Cathedral of the Pines is one of New England's most moving and spiritual places. Situated on a secluded hilltop amidst spindly, fragrant pines with glorious Grand Monadnock Mountain as its backdrop, this nondenominational sanctuary is a place to reflect, to give thanks for nature's beauty, to honor those who have served America and to worship in whatever way suits you. Stand Down Every year, the Connecticut Department of Veterans Affairs conducts a full day event called “Stand Down” to provide free assistance and service information to homeless and indigent veterans of our state. Chapter members participate by performing many tasks including cooking and serving food. 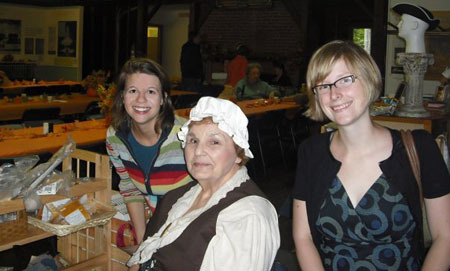 Above, DAR members and guests at the 2009 Colonial Ham and Bean Supper. Above, chapter members recognize Veterans Awareness Day in 2010.